Chamber 1 is a fully anechoic chamber. This site is optimally configured for and is configured for compliance testing to EN and IEC immunity requirements. Additionally, Chamber 1 will yield fast and repeatable emission pre-testing results to CISPR, EN and FCC specifications. 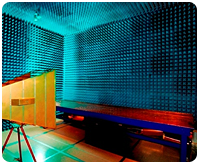 Chamber 2 is a fully anechoic, dual purpose chamber. This site is configured for testing both Military/Aerospace EMI and for CE immunity requirements. The chamber is equipped with a large double leaf door, and a flexibly sized test table (up to 30 ft. long), capable of supporting large, system level UUTs. Additionally, Chamber 2 will yield fast, accurate and repeatable emission pre-testing results to CISPR, EN and FCC requirements. 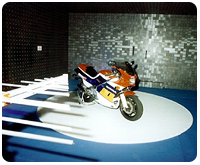 Chamber 3 is a semi-anechoic, full-scan height chamber. 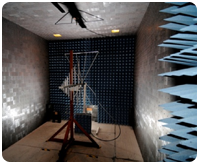 This chamber is perfectly suited for RF emissions and transmitter performance testing for FCC, IC, CE mark, VCCI and CISPR. The zero ambient performance of Chamber 3 makes it ideal for providing fast, accurate readings in a convenient, indoor environment. 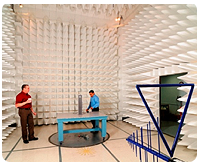 The Fremont Military Chamber is a semi-anechoic chamber, specifically configured to meet the unique test site requirements of military, commercial aerospace and automotive EMC testing. 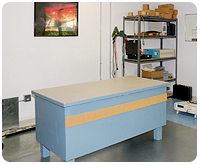 The chamber is equipped with an attached isolation room for UUT support equipment, a large, 3’ wide door, and a 12 ft. test table, capable of supporting up to medium size system level UUTs. The Fremont Immunity Bench specializes in power line, signal line and contact immunity tests to EN and IEC specifications. Electrical fast transient bursts (EFTB), surge, voltage dips, variations and short interruptions (VDI), ESD and magnetic immunity tests are all performed on this site.